... an author, teacher, activist and coach for leaders and teams who want to create a better world from the inside out. 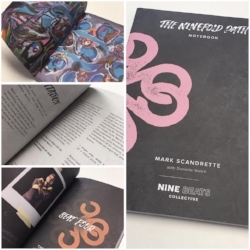 Mark has written five books on practical spirituality that seek to apply spiritual wisdom to everyday life: FREE, Practicing The Way of Jesus, Soul Graffiti, Belonging and Becoming (Co-authored with Lisa Scandrette) and The Ninefold Path Notebook (with Danielle Welch). He regularly teaches and offers workshops and training events based on themes from these books. Before each book is published he usually spends several years piloting the concepts and processes explored with groups in multiple contexts. He is currently working on a 6th book on self-awareness, personality and transformation. Animate Faith, An imaginative exploration of Christianity's big questions. Sparkhouse/Augsburg Fortress brought together seven leading Christian voices to create an accessible, captivating exploration of big questions of the Christian faith, including Mark Scandrette, Brian McLaren and Nadia Bolz-Weber. Mark is a gifted teacher who draws on his knowledge of Christian theology and scripture, human psychology, 25 years experience as a pastor and seeker with an awareness of the beauty, challenges and complexity of the human condition. He speaks nationally and internationally at universities, conferences and churches and offers training to leaders and organizations through workshops, retreats and group intensives. Mark teaches a doctoral course on spiritual formation at Fuller Theological seminary and has taught courses at Pittsburgh Theological Seminary and Church Divinity School of the Pacific. Wherever Mark travels he speaks with the goal of awakening imagination and inviting audiences to take new steps into life and wholeness. Mark and Lisa Scandrette lead 1-3 day Thriving Family workshops on themes from their book, Belonging and Becoming. Mark facilitates a 1-3 day training experiences for leaders and groups based on The Ninefold Path journey through the Beatitudes. Mark often teaches on the dynamic between personality and spiritual growth using the language of the Enneagram typology. He also facilitates sessions on the Enneagram and relationships. Mark offers experienced-based graduate level training on practical spiritual formation design and facilitation. Mark leads workshops and intensives on practical simplicity related to time, money, meaning and global sustainability. Mark is committed to seeking the common good of his neighborhood and city through personal action and organized efforts towards justice, compassion and ecological sustainability. He currently focuses his efforts locally on neighborhood safety and police reform. He also serves as an advocate for the work of Compassion International, an organization that provides wholistic child development services to children living in the poorest communities on the planet. Mark is passionate about investing in emerging leaders and building capacity in others. He offers coaching and spiritual direction to individual leaders and works with teams to help them develop transformational strategies and practices in their organizations. One-time individual or team consultation. Ongoing monthly coaching or spiritual direction. Leadership retreat/ off-site designed around the needs of your team. Pricing is based on the resources of the individual or organization. Mark and his wife, Lisa Scandrette, are cofounders of ReIMAGINE, A Center For Integral Christian Practice, based in San Francisco. ReIMAGINE is a non-profit organization that fuels efforts to help people experience greater wholeness through encounters with the life and teachings of Jesus by (1) awakening imagination, (2) inviting participants into transformational experiences and (3) empowering leaders who can transform their communities. Mark and Lisa have been married for 27 years and have three young adult children. They have made their home in San Francisco's Mission District since 1998. 1. Explore Mark's published resources, and use them to go deeper with a small group. 2. Come to a live learning event. 3. Invite Mark to speak at an event in your community. 3. Contact Mark about in person or online leadership coaching. 4. Sign up to the mailing list to receive occasional reflections and event updates. How can Mark support your efforts to imagine and live fully into the life we were made for? FUN NEWS. Our book, FREE: Spending Your Time and Money on What Matters Most, is now in it's 6th printing! Grateful for many inspiring stories of people who have worked through steps to courageously align time and money with deeper purpose and global sustainability.